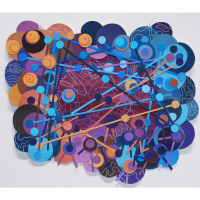 DOVER – Traversing our Earth from varying aerial and x-ray perspectives, Organic Cartography, a Gallery 6 art exhibition at the Children’s Museum of New Hampshire in Dover, highlights the similarities between seemingly disparate natural elements. On view through January 3, 2019, the nine included artists navigate with texture, pattern, scale, and line, and explore the structures of forests, storm systems, constellations, geology, biological forms, and much more. Many of the included artists also investigate the impact of the human footprint on the natural landscape through their work. “Perhaps some of these concerns are reflected in the careful sensitivity of their observations,” said Kirchmer. Technology’s mediation of human communication and connection to one another and to our land, as well as themes of surveillance and isolation, are additional considerations by these artists. Participating artists include: Matthew Boehm (Hopkinton, NH), Kyle Browne (Boston, MA), Jackie Brown (Brunswick, ME), Kayla Goulden (Portland, ME), Kate Higley (Eliot, ME), Sarah Hulsey (Somerville, MA), Nathalie Miebach (Boston, MA), Suzanne Pretty (Farmington, NH), and Miranda Updike (Ipswich, MA). A reception will be held on Friday, November 2 from 5-7pm at the Children’s Museum of New Hampshire during Dover’s monthly Art Walk. No admission fee is required to view the art in Gallery 6. Regular admission applies for families who wish to also explore the rest of the Museum. To learn more about this art exhibition or about the Children’s Museum of New Hampshire please visit www.childrens-museum.org.